Southside Family Of Purpose-Diva Night March 5, 2010 7pm. Holy Trinity-(Long Beach, Ca) May 29, 2010 3:00 pm. On The Right Road Ministries 3:30 pm, Long Beach August 15, 2010. September 1st-Outreach, Mt. Caramel Park Concert Event @ 7pm. November 19, 2010 "On The Right Road Ministries @ 7:00 pm. December 3, 2010 @ 7pm Carson Civic Center. Decmeber 4, 2010 @ 12:00 noon-World Aids Day "Hip Hop Cafe" Youth Exp. @ Grace United Methodist. "Recovery Impact Day" Community Event! August 27, 2011 @ the Royal Palms Recovery Center! 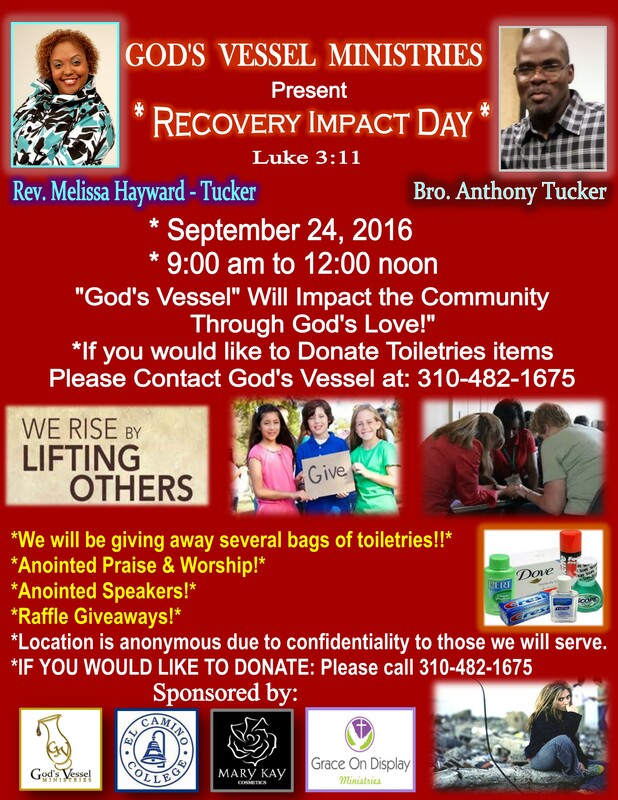 3pm-6pm God's Vessel will give away over 300 bags of toiletries to those in need! FREE Event! March 17, 2012-Vessels Of Transformation-Prayer Summit & Youth Explosion Leadership Conference! Youth Speaker Saturday. March 31, 2012-"Prayer & Praise-A-Thon-God's Vessel Ministries partner ministry. Community Outreach Event! August 18, 2012 God's Vessel Recovery Fundraiser Concert!!!! 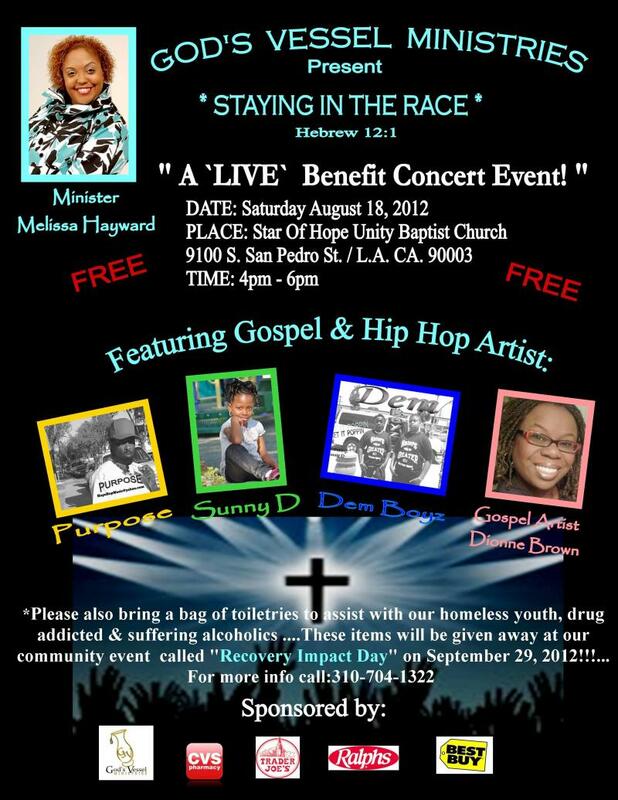 "Stay in The Race"
RECOVERY IMPACT DAY, CELEBRATION OF LIFE Concert Event! 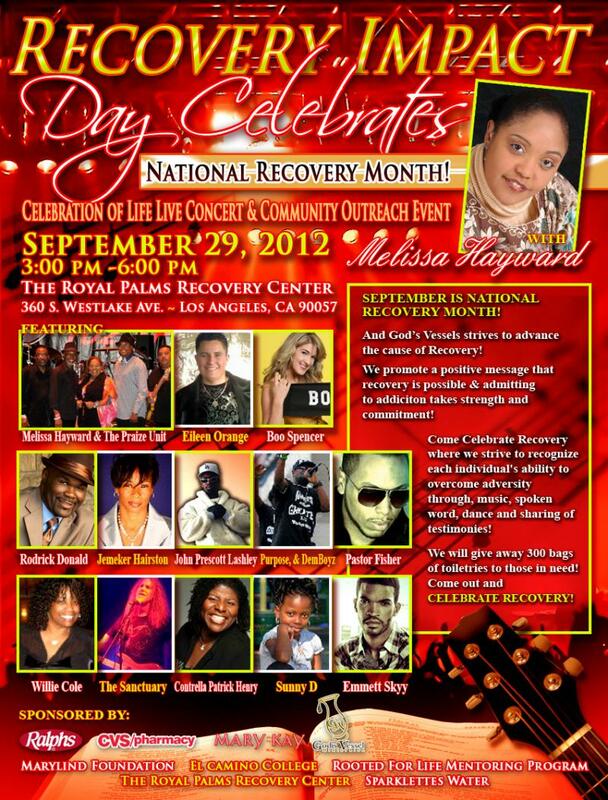 2012- will be September 29, 2012; at "The Royal Palms Recovery Center 3pm. Artist to be announced! REVELON WALK FOR CANCER, May 2014. RECOVERY IMPACT DAY 2014!!! 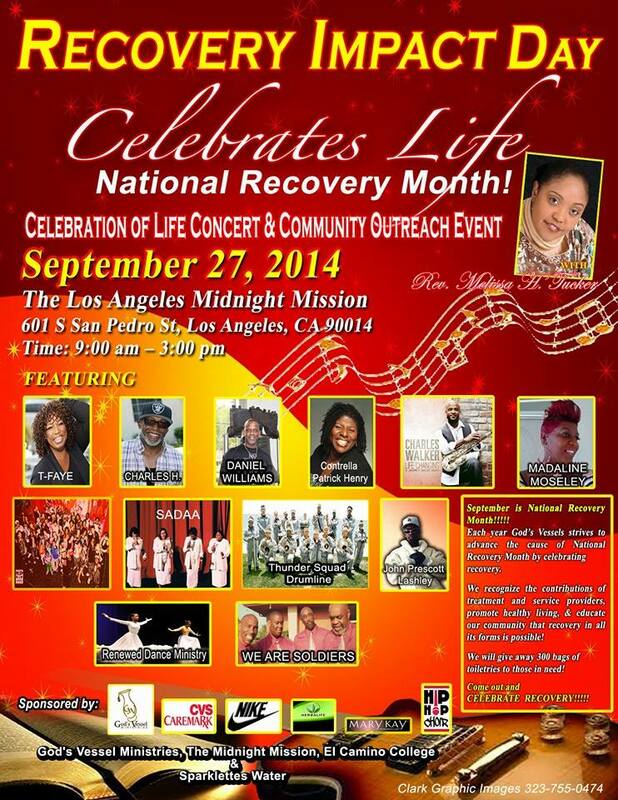 Will be held at the "Midnight Mission" Dowtown Los Angeles, September 27, 2014 from 9:00am - 3:00 pm. WE NEED YOUR HELP! WE ARE ASKING FOR DONATIONS OF THE FOLLOWING ITEMS! TO GIVE AWAY AT OUR "Community Impact Day 2014" CONCERT EVENT!!!!! God's Vessel Ministries is a faith base 501 (c)3 Non-profit organization, all donations are tax deductible.